En primer lugar utilizaremos una pasta formada por 50% de pasta de goma y 50% de fondant teñidos del color deseado, en este caso color carne. 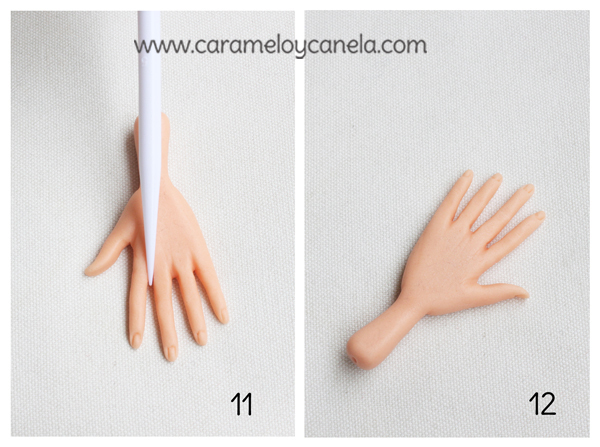 Today we are going to learn a step by step tutorial how to model a hand with fondant. Although it seems difficult just follow these simple steps. Maybe the first one does not come out perfect … Relax, just try! First of all we will use a paste made up of 50% gumpaste and 50% tinted fondant of the desired color, in this case peach color. The first step will be to obtain a smooth ball that we will get by stretching and folding the dough until obtaining a paste soft to the touch. We will form a ball smoothing all the folds and imperfections. (Figure 1). You will model a cylinder to which we will give shape of shovel trying to give it the anatomical shape of the hand. (Figure 2). Cortamos un triángulo en el lado derecho o izquierdo dependiendo de la mano que estemos realizando. 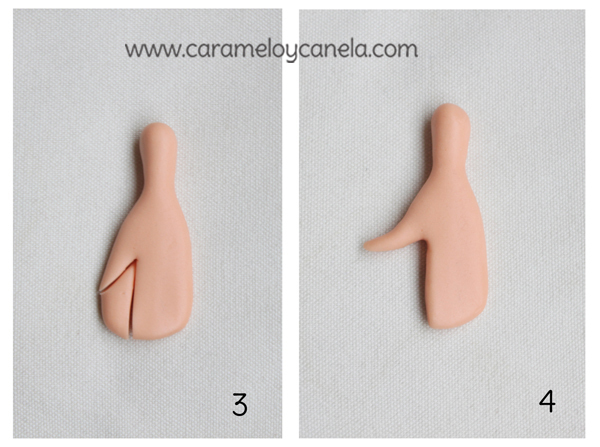 Retiraremos este triángulo y modelaremos el dedo pulgar redondeándolo hasta obtener la forma deseada (Figuras 3 y 4). Then, we will cut a triangle on the right or left side depending on the hand we are working. We will remove this triangle and model the thumb round it until obtaining the desired shape (Figures 3 and 4). Después haremos tres cortes que serán las separaciones de los cuatro dedos (Figura 5). Ahora separamos los cuatro dedos y les vamos dando forma redondeándolos igual que hicimos con el pulgar. Recortamos el sobrante de pasta para conseguir el largo deseado de cada dedo (Figura 6). We will make three cuts that will be the separations of the four fingers (Figure 5). Separate the four fingers and form them rounding them as we did with the thumb. Cut the leftover paste to get the desired length of each finger (Figure 6). Ahora trabajaremos los detalles que darán realismo a nuestra figura. Para empezar daremos la vuelta a la figura y marcaremos las separaciones de los dedos (Figura 7). Ahora colocaremos la figura en la palma de nuestra mano. Por último y con un bolillo ahondaremos un poco para formar la palma teniendo cuidado de no deformar la figura (Figura 8). Also now we will work the details that will give realism to our figure. We will turn the figure around and with a pointed tip we will mark the separations of all the fingers. (Figure 7). Now we will place the figure in the palm of our hand and with a bolillo we will deepen a little to form the palm taking care not to deform the rest of the figure. (Figure 8). Con una esteca curva marcaremos las articulaciones y los pliegues y arrugas naturales fijándonos en nuestra propia mano. (Figuras 9 y 10). With a curved tool we will mark the joints and the natural folds and wrinkles by fixing ourselves in our own hands. (Figures 9 and 10). Ahora damos la vuelta a la figura y con la esteca de punta marcaremos la separación de los dedos y la forma de las uñas. (Figura 11 y 12). Now we are going to turn the figure and with the pointed tool we will mark the separation of the fingers and the shape of the nails. (Figures 11 and 12). Y ya tenemos terminada la mano! (Figuras 13 y 14). Finally you have finished the hand! (Figures 13 and 14). Finalmente dejamos secar en la posición deseada. Y ya estará lista para colocar en la figura! 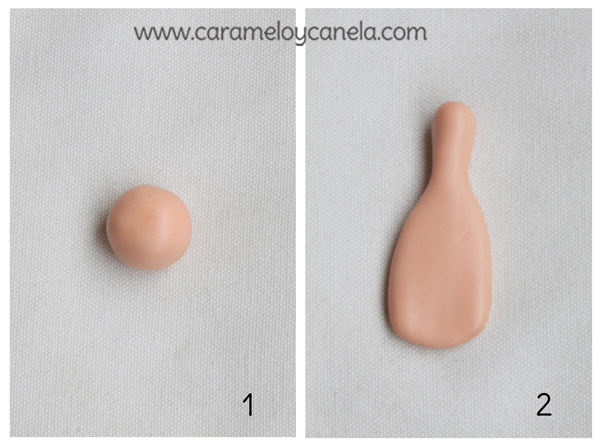 Let dry in the desired position and you will be ready to place it in the figure!